The series “How To Conduct Market Research For Your SME” is intended to help you understand market research as an important process for your business and what steps you need to undertake to conduct a successful market research process for your SME. In Part 1, we discussed the first major step in market research – Country Analysis. Part 2 was about the importance and the framework of Industry Analysis. Today, in the last part of the series, Part 3, we’re going to discuss Competitor Analysis and what you need to execute it successfully. When you start a business, you have to know what your place in the marketplace is. To be aware of your place is to know your competitor’s position too. Researching your competitors means that you can easily find what are their strengths and weaknesses which in turn, will help you develop strategies that can enhance your competitive advantage. Competition analysis is one of the most important segments of a successful market research process. 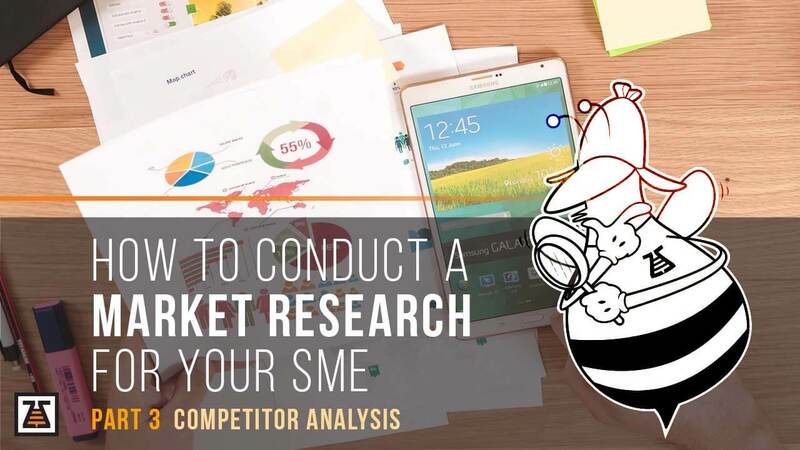 With that in mind, in part 3 of our “How to Conduct Market Research for Your SME” series we want to discuss competitive research in the marketplace and how to execute it successfully. Who are my competitors exactly? Every business that offers the same or similar product or service as yours within your geographic position is your direct competitor in the marketplace. Other companies that offer substitute products that are related to your product and service are considered indirect competitors. Indirect competitors may satisfy your target customer needs, but with a product that is different from yours. That’s why you need to constantly watch their activities because they easily can decide to enter your target market and vice versa. Method on how to use the information to develop a successful strategy. Do I need to analyze every competitor? If you want to work in a market with a lot of competitors, the task of analyzing them becomes hard. The 80/20 rule (Pareto principle) becomes practical in these situations, as it is hard to collect and maintain information about hundreds and thousands of competitors. In markets with too many competitors, it is probable that 80% of the market revenues are earned by 20% of the competitors. That 20% are the ones that you need to keep an eye on. Who are my competitors and what products do they offer? Are they making a profit? Do their businesses expand? Or they scale down? What is positive about them in my customer’s eyes? Negative about them in my customer’s eyes? What makes my business different from my competitors? Do I have any competitive advantage over my competitors? Do they operate in my geographic area? What is their pricing system? What is their total sales volume in the market? Is their product better in quality than mine? What kind of resources do they own? In order to successfully gather information about your competitors, you need to find the right sources of information first. For instance, there are several secondary sources that can do the job like marketing reports. Marketing reports that are offered to the public or for general use are like a pool of information and data. You may want to look into competitor advertising and branding campaigns too. The advertising campaigns of your competitors can show their promotional budget and their branding plan. Sales brochures are another valuable data pool too. Owning the latest sales brochures about your market can give you information about how your competitors are positioning themselves in the market and how they use their product features to sell successfully. Magazines are also an excellent source of information that you can use to get a grasp of your biggest competitors in your market, what are their plans and what are their new products and innovations that they offer in the marketplace. Also, professional journalists can reveal lots of information about your competitors, including information that is unfavorable for your competitors valuable for you. If your competitors are publicly held company, their annual reports are definitely something to consider if you want to collect valuable competitive data. Annual reports can give you with financial information, information about their sales volume, their increase in revenue as well as their market share. When you know you have every information that you need for your competitors, it is time to analyze it. The purpose of this analysis is to discover product information, market shares, marketing strategies, and to identify strengths and weaknesses. Either the products of your competitors have these features or they don’t. It’s really straightforward. The next thing you should do is to evaluate your own product and see how you stand with the competition. Which features are unique about your product? Also, evaluate yours and your competitor’s pricing system. Just because you offer the same or similar product in the market does not mean that you will offer the same price. Pricing is affected by production costs, packaging costs, shipping costs and marketing costs. If your competitor’s product is exactly the same as yours but they still want to offer it at a much lower price, it means that they might be in financial trouble and that’s an extremely valuable information that you can use to position yourself even stronger in the marketplace. The best indicator of a company’s sales performance is the market share. Even if your competition has a product that is lower in quality than your product, if the competition generates enough sales, they can define product standards in the industry and influence perceptions about the product or service. For each of your main competitors you need to determine their market goals and what strategies do they use to achieve them. Do they try to maintain or increase their market share? Maximizing short-term or long-term profit? Do they want to introduce innovation in the market? Or they want to become market leaders? Once you know what your competitors want to achieve, you will have to assess what are the strategies that they use so you can counter-punch them with your own strategy. To develop a thorough strategy for your SME, you need to make a pragmatic assessment of your competitor’s strengths and weaknesses. Why are some competitors more successful in the market than you? To conclude, you need to do competitor analysis on a regular basis if you want to know how the competition operates their businesses and how to beat them in the process. Competitor analysis is a never-ending process. Markets change quickly, and so does the competition. New players come and go in the market, and the economy falls and gets back up. You can evaluate your position in the marketplace only if you understand your competition. There’s no other way around it. Thank you for your attention. If you are an Entrepreneur that wants to start a business or own a company that wants to expand, wants to successfully identify trends and competitors and better understand his clients but still not sure where to begin, BizzBee is here to guide you through the steps that will help you differentiate from your competition. Our expertise is in working with Entrepreneurs and Start-ups and we can guide you throughout the entire process. I know I am getting experience every day by reading such good content. It’s going to be end of mine day, except before end I am reading this fantastic post to increase my experience. and I have you saved to fav to look at new information in your web site. I am extremely impressed together with your writing skills and also with the structure in your weblog.